Oh my. I never thought I would be doing this kind of post. But i have so much fun doing the decorating stuff, as you may have called it, and it turned out just the way i wanted it. Even better actually. But please don't be so expecting okay. So first thing first, i got over those broken feeling of that sad sad fanfiction of Destiel which is probably due to by reading other too unrealistic sweet fluffy love story. Anyway, today is a long day. We have class from 8 to 5, supposedly. We started at 8.20 am (i notice, do acknowledge that i freaking notice this) and finished at 4.20 pm. We even have extra 30 minutes for lunch hour. This few weeks will be PACKED. 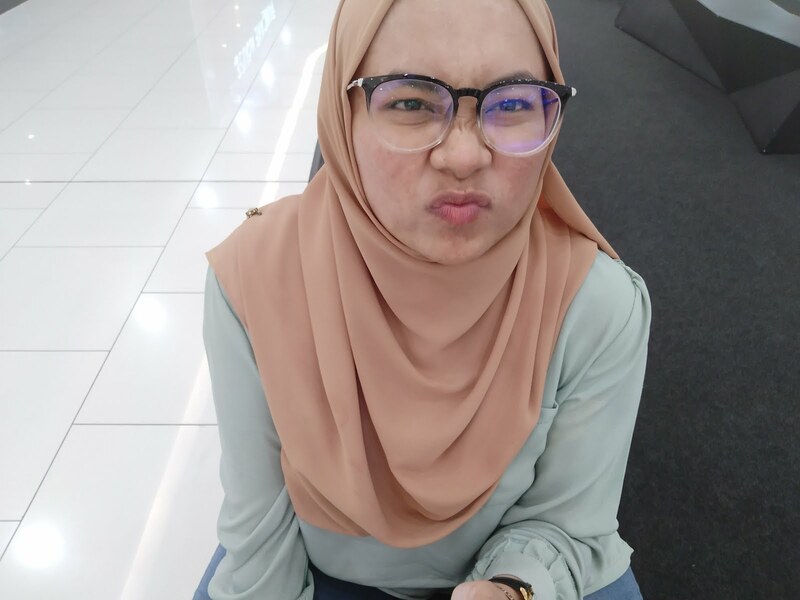 I think it was rather purposely since upon starting clerkship, it loosen a little. Only a little though. It's going to be worst. I will need to be well caffeinated to go through life. I actually have stripped the previous ones. It was a clutter. I like clutter stuff but this table is too small and the clutter mess my mind. It annoys. 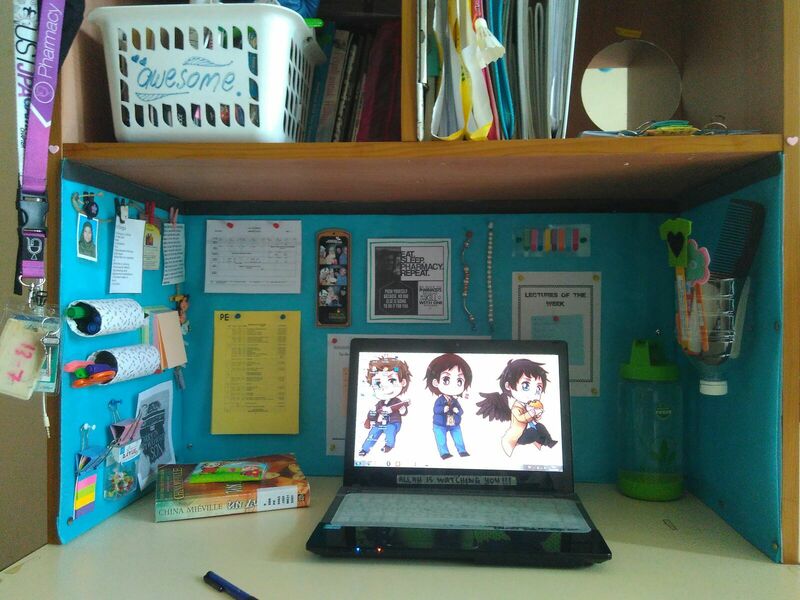 Previously in KTSN, i do clutter. We have a simple and spacious study table with a blue board hung on the wall. The table was quite big so i can be messy but still have space. Whoa. It sounded like i'm a freaking mess. 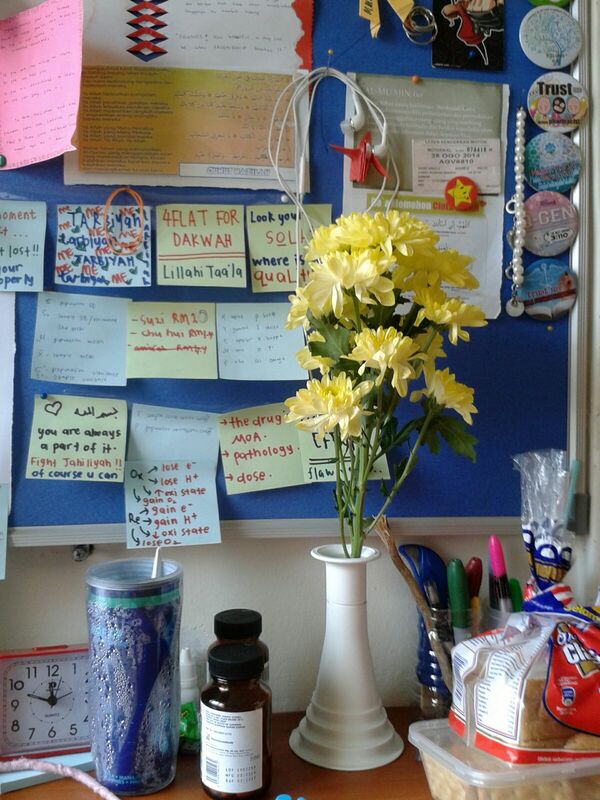 This is my study table at KTSN. 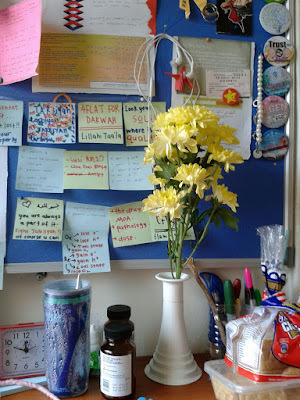 I didn't have a better picture but the messy pens and flower and bread and vitamin were on the edge. I still have much space on the table to do stuff. Now, I was thinking to actually do it right. Like deco stuff right. I research! Tumblr and Pinterest and come to a specific colour that I want and actually get exactly the one I pictured. It was so satisfying. the process took ages though. Most likely because I wanted to sing a long since I was on Youtube and keen to discover Panic! At the Disco and All American Rejects and Fall Out Boy and freaking relive the songs I used to hear during highschool. I love to sing. My housemates can vouch for that. Not only that, it is quite thin and the hideous marks where still visible though I do two layers. I took my used A4 paper with blank space at one side to first cover it. It took AGES. i felt slighly shy to took better picture. I remove that bottle at the right. It felt bit crowded. The bracelets were perfect. Both were gift from Sabah. I don't really wear them but i like pearls. It finally deserve a purpose! 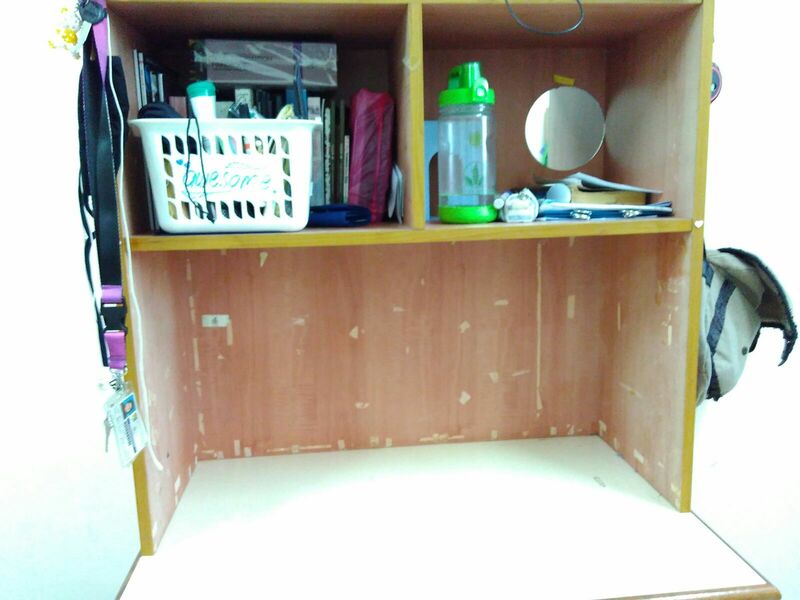 At the left side, that thing i made to put my stationary was actually the cardboard of our tissue rolls. It is very convenient now. 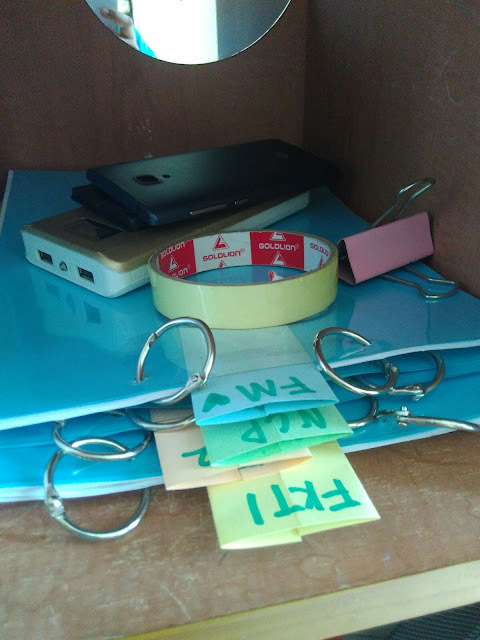 I left my pencil case in my bag and simply use the stationary i put there. Less clutter on the table when i'm doing my work and no more forgotten it of course. Previously i have those pen pot which its' spot was replaced by my drinking bottle. I only have my drinking bottle on my table now. I put my laptop on the top side when i didn't use it. It felt really nice to have empty table since it is small and dark. I was thinking to put some light but cancelled it since it means more things on the table. Did i tell you that the colour was perfect? It really is! It is those transparent paper whereby i couldn't explain how it actually is and i don't know what it is called. But just look at the colour!! It was exactly as i've picture. The paper was so long but i just love the colour tad too much and buy it right away. I have plenty more and can actually cover another 2 or 3 table. I got it at MPH and it cost me only RM5. I spend about another RM3 for the colourful push pins from a stationary shop here called Beacon. I have the thumbtack for forever now. It's cheap though, below RM1. I have my notes on the right of the upper side. The one that laying down. I even managed to label it such way I can easily recognize which is which simple. Look at the picture below. that is my broken Redmi 1s. It was annoying sometime to twist around the note as i put the rings but if i didn't do it that way, the notes will be misplaced REGULARLY. I lost thing easily and get messy even more easily. I learn this useful tips whereby you need to have a designated place for stuff so by time, unconsciously, you will start putting your things at the right place. It work. My friend don't really know my blog and i didn't really wanted them to. The writing me was quite different from the actual me. Bit more outgoing and cheerful sort of. Lame most likely a suitable word. Like those lame thing we do because we are normal and not as cool as the Winchester brother.